The American doctor and author of works on physiognomy Joseph Simms wrote to Darwin on 14 September 1874, while he was staying in London. He enclosed a copy of his book Nature’s revelations of character (Simms 1873). He hoped it might 'prove sufficiently interesting’ that Darwin could ‘say a word in its favour for print’. The book contained the following portrait of Darwin to illustrate ‘Observativeness Large’, the ‘quality or disposition to look closely and with rigid care at every object’. If you will favour me you can plant the foot on white paper lightly while sitting and with pencil draw an outline close round the entire foot. It matters not whether with stocking or not. Better without stocking. If you grant this unusual request please give your height while standing in stockings. The foot could tell the physiognomist quite a lot about the owner’s character. For instance, those with ‘arched or cat-shaped’ feet were liable to concealativeness, the inclination to hide or withhold the knowledge of things or thoughts. While flat feet were indicative of small secretiveness (Simms 1873, p. 154). A ‘broad foot’ indicated ‘demolitiousness the inclination to destroy: the propensity to mar, deface, or destroy' (Simms 1873, p. 166). Unfortunately, we do not know what Darwin’s feet were like. The only known clear depictions of his feet are with shoes on in a photograph of him seated in wicker chair at Down, and in a Vanity Fair caricature, which is probably not a reliable source. 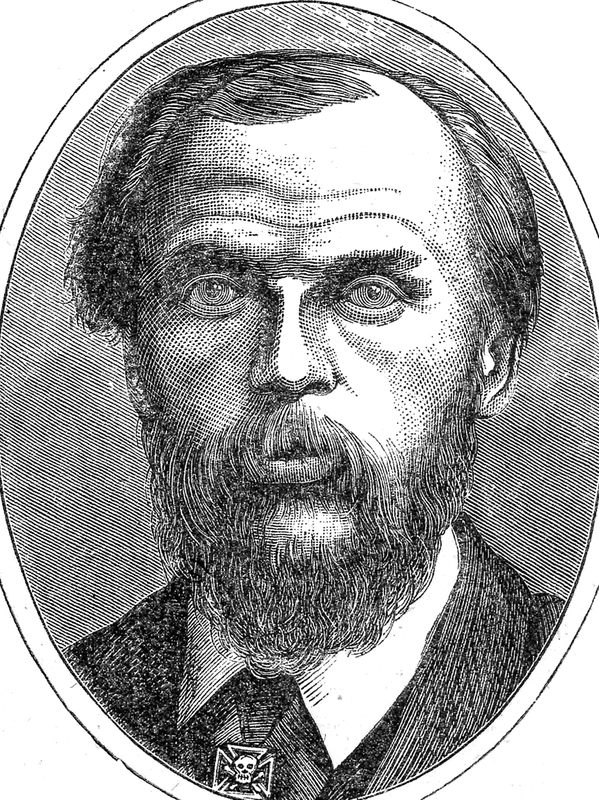 According to an American Cyclopedia entry, as a child Simms had been ‘unconsciously drawn to the practice of noting facial and corporeal peculiarities, systematically comparing them with known mental characteristics, and educing certain assured rules and formulae’ (‘Biographical sketch’, 1897). He started lecturing in major cities of the US and Canada on physiognomy in 1854. In 1866 he sought training in anatomy from John William Draper, founder of the University of New York medical school and author of the conflict thesis of science and religion. He graduated as a medical doctor in 1871 from the Eclectic Medical College of New York. However, he soon returned to physiognomy, embarking on a three-year lecture tour of Britain in 1872, including 52 lectures in London alone. As well as Europe, he later toured Australasia, Africa and Asia before retiring in 1884, having made a considerable fortune (New York Times, 13 April 1920). Simms himself, of course, was ‘a man of mark, being six feet high, of splendid proportions, and fittingly endowed by nature for the arduous physical and intellectual labours of his well-spent life’ (‘Biographical sketch’, 1897). Later versions of his physiognomy textbook appeared as the hugely popular Physiognomy Illustrated, which was in its tenth edition by 1891. The work saw degeneration in the fact that American faces were becoming less different and people were ‘nearly as indistinguishable as sheep’ (Burrows 2008, p. 11). In 1912, Simms was involved in a minor scandal when he was arrested in Central Park for carrying a revolver without a permit. He had pointed the gun at a five year old boy after the boy had picked up rice that Simms and his wife fed to the squirrels. He received a suspended sentence because he could prove the gun, a relic from the Mexican war, was never loaded or discharged. When Simms died in 1920, his widow carried out his request of donating his body to medical science. The body was sent to George Sumner Huntington’s laboratory at Columbia University, where Edward Anthony Spitzka removed the brain. Spitzka was prosector of the American Anthropometric Society and he had studied the brains of many well-known men. He weighed it, concluding only that given ‘Dr. Simms was nearly 87 years old, the weight was above normal’ (New York Times, 13 April 1920). ‘Body of lecturer given to science, Dr Spitzka removes brain of Dr Simms, seventy years a student of physiognomy ’, New York Times, 13 April 1920. Burrows, Stuart. 2008. A Familiar Strangeness: American Fiction and the Language of Photography, 1839–1945. Athens, Georgia: University of Georgia Press. Darwin, Charles. 1872. The expression of the emotions in man and animals. London: John Murray. Simms, Joseph. 1873. Nature’s revelations of character, or, the mental, moral and volitive dispositions of mankind, as manifested in the human form and countenance. London: Printed for the author. Simms, Joseph. 1891. Physiognomy illustrated; or, Nature's revelations of character. A description of the mental, moral, and volitive dispositions of mankind, as manifested in the human form and countenance. New York: Murray Hill.